Today we take a tour of Chennai, visiting Fort St. George, the first bastion of British power in India & built in the year 1640 AD by the British East India Company. Within the Fort we visit St. Mary's Church, built in the year 1680 & oldest Protestant Church in the East. Fort Museum has 10 galleries & displays armoury, old uniforms, crockery & silverware, coins, palanquins, paintings, letters, old prints, etc. 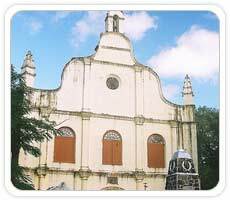 San Thome Cathedral, built in 1504, is said to house the remains of St. Thomas the Apostle, who is believed to have visited Madras (Chennai) sometime during 52 AD. Later we drive to Mahabalipuram, town of temples, sand & sea. 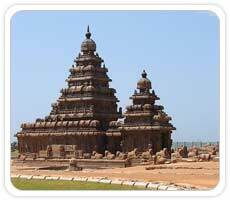 It is world renowned for its beautiful Shore Temple & other temples. 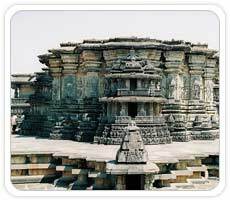 It was once the main port & naval base of the great Pallava kingdom & was later made the capital of this dynasty. Most of the temples here are dedicated to Lord Shiva & Vishnu. These structures were built by three successive Pallava Kings, between 630 A.D & 728 A.D, who developed the Dravidian style of temple architecture within the short span of a hundred years. The monuments are mostly rock-cut & monolithic, constitute the early stages of Dravidian architecture, wherein Buddhist elements of design are prominently visible. It is known especially for its rathas (temples in form of chariots), mandapas (cave sanctuaries) & giant open-air bas-reliefs & has been classified as UNESCO World Heritage Site. Today we drive to Tanjore, flourished during the rule of the Nayaks & Mahrattas. It has been the treasure house of art for centuries. It is called the Rice Bowl of Tamil Nadu. Thanjavur is well-known throughout the world for its exquisite handicrafts like the Art Plate, pithwork, bronze icons, Thanjavur paintings & the classical South Indian musical instruments. Today we leave for Madurai, rich cultural heritage passed for more than 2500 years old & has been an important commercial centre as early as 550 AD. 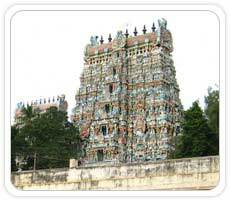 It is the oldest city in Tamil Nadu & was originally known as Kadambavanam or the forest of Kadamba. 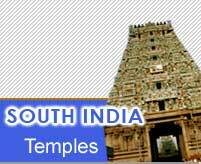 En route we stop at Trichy, which has very historic temples, monuments & churches. 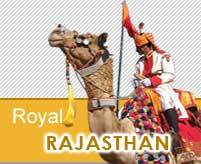 It was an important town in the days of the later Cholas, Nayaks as well as during the early days of the British East India Company. We start with Srirangam Temple, surrounded by the waters of the River Kaveri on one side & its tributary Kollidam on the other, is a 600-acre island-town enclosed within the seven walls of the gigantic Sri Ranganathaswamy Temple. 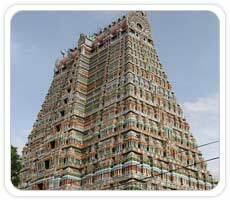 There are not less than 21 Gopuram here in this temple, one of which is the tallest in South India. Morning visit to Meenakshi Sundareshwar, was first built 2000 years ago & was substantially expanded between the years (1623-55 AD). Initially there was only the Shiva temple. A striking feature of the temple is the astonishing structure known as Ayiramkaal mandapam or the Hall of a thousand pillars in the outermost corridor. Today we drive to Periyar, Set on an attractive lakeside, it is South India's most popular Wildlife Sanctuary. It is a place to cruise on the lake & gives an opportunity to see wildlife. It is home to tigers, leopards, elephants, bison, antelopes, sambhar, wild boar, monkey, a wide variety of birds. Then we visit Kanyakumari, situated at the shore on the confluence of the Bay of Bengal, Indian Ocean & the Arabian Sea. got its name from the Kumari Amman or the Kanyakumari Temple According to the local lore, Kanya Devi, an avatar of Parvati, was to marry Shiva, but he failed to show up to the wedding. The rice & other grains meant for the wedding feast remained uncooked. Today tourists can buy tiny stones which look like rice, in remembrance of the marriage that was never solemnized. Next we visit Kanyakumari Temple: The temple overlooks the shoreline. It is dedicated to Parvati as Devi Kanya, the Virgin Goddess who did penance to obtain the hand of Lord Shiva. The deity, Devi Kanyakumari is' the protector of India's shores' has an exceptionally brilliant diamond on her nose ring which is supposed to shine out to sea. Also visit Vivekananda Memorial, about 500 meters away from mainland. This memorial stands on one of two rocks separated by about 70 meters. 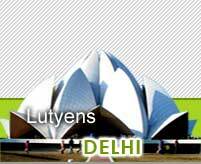 It was built in the year 1970, memorial is dedicated to Swami Vivekananda, the greatest social reformer. He was supposed to have medicated on the rock where the memorial stands today. A meditation hall is also attached with the memorial. 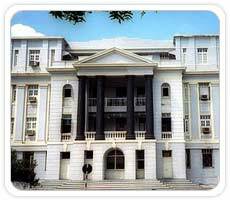 It houses a statue of Vivekananda. The divine foot print 'Pada Parai' of Devi is also seen here. Ferry service is available to reach the memorial. 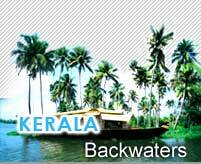 we board the houseboat, locally called Kettuvallam, cruise around beautiful backwaters of Thothapalli to Alleppey to observe & experience the daily life of the villagers along the backwaters. Today we disembark the boat at Alleppey. Later drive to Cochin always had a very popular & historical sea trade connection with Middle East, Mediterranean Europe & Dutch. It has one of the finest natural harbours on the Arabian coastline. Its cosmopolitan character is reflected in the buildings & structures representing different regions of the world. 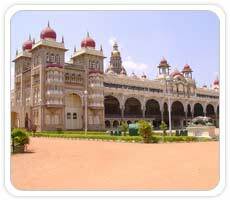 We take a full day City Tour of Mysore with visiting Srirangapatnam & Tipu's Summer Palace, the Maharaja's Palace & Chamundi Hill, which is topped with a temple of Durga with the magnificent 5m tall Nandi, carved from a single piece of granite in year 1659, one of the largest in India. Today we take a day excursion to Hampli, the capital city of the Vijaynagar Empire. Founded by Harihara & Bukka in 1336, it fell to the Muslim rulers in 1565 after the disastrous Battle of Talikota, subsequently lapsed into decline & abandonment. The once proud city of victory is now a city of desolation. Later we drive to airport to baord flight for Bombay. We arrive Bombay transfer to the international airport to board flight for onward journey. 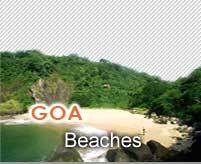 20 Nights accommodation on twin sharing basis with short stay in Mumbai.